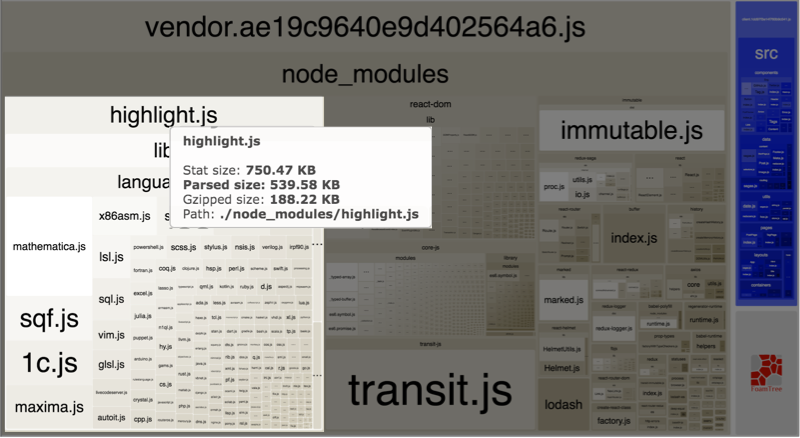 Disclaimer: This post is based on Brian Jacobel's great post about reducing highlight.js's bundle size, since he doesn't have a comment section on his blog, I figured I would add a few more details as well as some updates for webpack2 here. In an attempt to improve the performance of this blog, I am currently trying to bring down the size of my assets. I use webpack2 to bundle the code for my apps and I currently split my chunks into vendor (all third-pary libraries, i.e. node modules) and application code (although I might use some more advanced code splitting techniques in the future). The problem: highlight.js is taking up almost 25% of the total bundle size. When I started analysing my vendors chunk, I was quite surprised to find that highlight.js took up almost 25% of my total bundle size. The problem? All available languages are automatically included, although I am only using a small sub-set and am not planning on adding more any time soon either. To analyse my webpack build, I used the amazing webpack-bundle-analyzer plugin. Brian used the webpack-visualizer plugin instead. More cool tools for analysing your webpack bundle can be found here. You can find a list of all supported languages on highlight.js' website or by having a look at their source code on GitHub. Thanks to using webpack2's tree shaking, this is all that has to done in order to remove all unnecessary languages from highlight.js. Please refer to the original post for details on how to achieve the same with webpack1. I guess the message of this post, despite concentrating on the specific case of highlight.js, is that knowing your third party libraries is really important. Don't add anything you don't really need and regularly analyse your bundle to find and eliminate more libraries that take up disproportionate amounts of space. In the case of this blog, I found a second library, taking up 15% of my bundle size: moment.js. And I only use moment.js to format Dates... And only in approximately 3 places! So instead of only removing their locales, as discussed in many places already, I actually just wrote my own date formatting utility.